Snow capped mountain peaks, lush green valleys, sparkling rivers, lakes and glaciers, along with gushing waterfalls and endless forests…the Canadian Rockies are known world wide for their spectacular scenery and pristine wilderness. Since 1885 Canadian Pacific Railway has been bringing visitors from all over the world to experience this exceptional destination. In a timeless tradition, Royal Canadian Pacific continues to share the experience of the Canadian Rockies with our guests in the spirit of our Royal Canadian Rockies Experience. Recognized as a “Tour of a Lifetime” by National Geographic Traveler in 2008, this luxury rail excursion is truly a testament to the beauty, heritage and culture of the Rocky Mountains. Our signature excursion, the Royal Canadian Rockies Experience is the perfect pairing of rugged beauty and regal elegance. Travel in royal luxury through majestic, inaccessible and spectacular terrain in the comfort of the Royal Canadian Pacific’s fully restored vintage rail cars. Your experience is enhanced by the inclusion of select off-train activities designed to accent the heritage, ecology and culture of the areas through which we travel. Welcome to Calgary - known as the “Heart of the New West”. When you arrive at the Calgary International Airport your private chauffeur will be waiting to greet you and transfer you to The Fairmont Palliser Hotel for your overnight stay. Join us for an early evening wine and cheese reception at the Canadian Pacific Railway Pavilion, where you will have the opportunity to meet your fellow travelers. Afterwards, dinner will be on your own, either in the hotel itself, or in one of the many unique restaurants and bistros on Stephen Avenue; just one block from the hotel. After breakfast, your luxury rail tour will depart the Canadian Pacific Railway Pavilion bound for Fort McLeod, Alberta where you will visit Head Smashed in Buffalo Jump, a UNESCO world heritage site for a tour. After the tour, meet your traveling companions for cocktails in our lounge car and enjoy a splendid dinner as the sun sets over the Alberta prairie. Enjoy a short excursion by motorcoach to Waterton-Glacier International Peace Park. The rare wild flowers, unusual geology, and pure beauty of this mountain park recognized as the “crown of the continent” will leave you awestruck. After some free-time to explore, board the private boat for a lake cruise of the scenic Waterton Lakes, traveling from Waterton, Canada to Goat Haunt, Montana, U.S.A. and back. This is sure to be the most exclusive border crossing you will ever experience. Returning to the train, travel through the Crowsnest Pass to the town of Cranbrook, British Columbia. This morning, a historical off-train excursion; you will visit the Canadian Museum of Rail Travel in Cranbrook. Telling the story of rail travel in Canada from the vantage point of it’s historical rail cars, this museum focuses on the changes in décor, finish, and service over the years since Canadian Pacific Railway was first established in Canada in 1885. Continuing north through the Columbia Valley, arrive in Golden for a sunset dinner at 7,700 feet in the Kicking Horse Resort’s Eagle Eye Restaurant, overlooking the Rocky and Purcell mountain ranges. Enjoy the views from an open air vestibule as the train climbs through Kicking Horse Pass. This pass was one of the biggest challenges to the building of the transcontinental railroad, now demonstrating the ingenious engineering feat known as the “Spiral Tunnels” which have allowed safe rail movement through the pass since 1908. On arrival in Lake Louise, interpretive guides will meet you and take you on a special walking tour at the lake, after which you have an opportunity for some sight seeing on your own. After time to freshen up and enjoy a cocktail with your fellow passengers, a gala dinner awaits for your final night on the train. Today, it’s all about you on our special options day. You have the option of a sightseeing tour of Banff by motorcoach, followed by lunch at the Banff Centre, or a gondola tour and lunch in Lake Louise, or for those who want to see it all from above, an optional helicopter tour of the mighty Rockies with lunch. An activity sheet will be sent with more details so that you can make your choice. After your activities, it’s back to the train for some time to pack and change for dinner, as the train heads back to Calgary for your final night in Calgary at The Fairmont Palliser hotel. After breakfast and checkout, return to the Calgary International Airport by chauffeur, marking the end of your journey with Royal Canadian Pacific. Prices do not include taxes and are listed in Canadian Currency. Schedules, prices and terms are subject to change without notice. 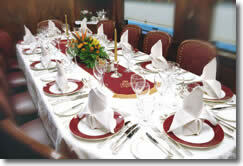 The Royal Canadian Pacific's luxury train excursions are the most lavish and exclusive rail trips in North America. Limited to only 32 guests, these trips book up early. Secure your reservation today by calling 1-800-717-0108.